In the Civil War's first year, thousands of North Carolinian's trained and fought for the Confederacy in Virginia. In 1861 Union Major General George McClellan devised a strategy he thought would force the Rebel Army to move some of their forces from Virginia. This maneuver he thought, if successful, would enable him to crush the weakened Rebel Army that remained in Virginia and end the war in 1862. In late August 1861, Union General Benjamin Butler brought the war to North Carolina. His assault on Fort Hatteras and and the subsequent capture of its garrison opened Pamlico Sound and threatened half of the North Carolina coastal region. The threat at home stirred many North Carolinian soldier's souls. Many requested to return to New Bern and other coastal towns so they could defend their home state. But Union activity on the North Carolina coast did not concern the high command of the Confederacy as long as the Union army was threatening the Confederate capital in Richmond Virginia. With the new year, Union action in North Carolina heightened. In February 1862, Roanoke Island was captured by a joint effort of the Union army and navy, with General Ambrose Burnside in charge of the army. On March 11, 1862, General Burnside departed Roanoke Island with an estimated 15,000 troops, many battle-hardened veterans from earlier combat, and met 13 heavily-armed gunboats at Hatteras commanded by Commodore Stephen C. Rowan of the Union Navy. On March 12, the fleet sailed up the Neuse River and anchored off what is now Cherry Point Marine air station. The morning of March 13 opened with the thunder, fire and roar of scores of heavy cannons bombarding the shores of North Carolina. Three full brigades of Union infantry, commanded by Generals John C. Foster, Jesse L. Reno, and John G. Parke, deployed to shore with a battery of six boat howitzers and two rifled wizards and began the march toward New Bern. Awaiting the Union force in New Bern was Confederate General Lawrence O'Bryan Branch, a politician with virtually no military expertise and an estimated 4,500 untrained and ill-equipped Confederate troops. The majority of the Confederates had not yet been issued military uniforms and most were armed with second-class muskets, antiquated flintlocks, and assorted sporting rifles and shotguns. The Union troops were armed for the most part with "modern" Springfield rifled muskets and English Enfield rifles, both of which utilized the deadly "mini" ball bullet. Amidst the roar was naval cannons bombarding the shore and woods in the direction of the Confederate line, blowing the top of trees apart and showering the troops below with fiery fragments of iron and wood. The early hours of March 14, 1862, proved to be a fatal test of combat for the Rebel forces. Under-equipped and outgunned by a force almost three times their size, the Confederates fought for almost four hours before being forced to retreat from the field. By early afternoon the smoke gradually diminished across the swampy pine terrain. New Bern, once the colonial capital Of North Carolina, was occupied by Union soldiers who stayed for the duration of the war. The Confederates lost with 68 killed, 116 wounded, and 400 captured or missing compared to Burnside's 90 killed, 385 wounded, and one man captured. Branch lost scores of desperately needed cannons and virtually all of the camp equipment and ammunition stores at New Bern. He also lost a valuable port and rail head, which ultimately became the headquarters of the Union army in North Carolina and proved to be a pain in the side of the Confederacy throughout the war. The only high point about the New Bern battle from the Southern perspective was the valor exhibited by its future wartime governor, Zebulon Vance, of the 26th North Carolina Infantry. Isolated from the main Confederate force with only a handful of troops from the 33rd North Carolina Infantry, Vance and the 26th held off an incredibly superior force, thus preventing inevitable damage to the city and population of New Bern by delaying Federal forces from their target. New Bern fell and the city, whose population was slightly over 5,000 individuals in the 1860 census, was occupied. By December 1862, a Federal army of well over 20,000 troops, more than the sum total of Confederate forces in the entire state of North Carolina now inhabited the town once called "The Athens of the South." Cedar Grove Cemetery, one of the oldest in North Carolina, is located in downtown New Bern. The monument in the photo above was dedicated to the Confederate soldiers killed in the Battle of New Bern. Beneath the monument about twelve feet down in a crypt lies the remains of the soldiers. The monument above was dedicated by the citizens of New Jersey to their soldiers who died in New Bern. 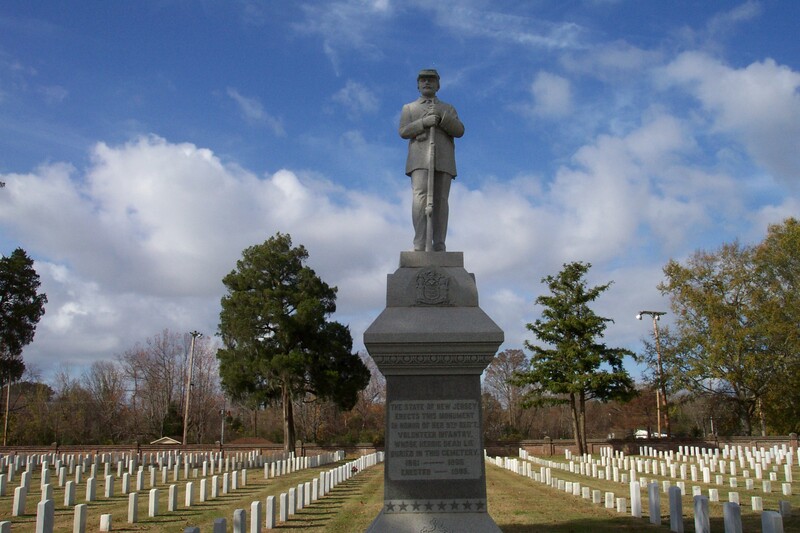 It is located in a National Cemetery about a half mile from Cedar Grove Cemetery. Shown below is a tombstone of one of the soldiers. In addition to the New Jersey monument, there are monuments to the soldiers from Massachusetts, Rhode Island, and Connecticut.